The women of Crossroads Christian Church are taking a 10-week journey of Extraordinary Faith. 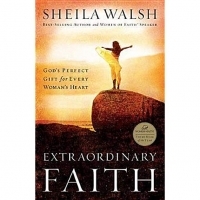 Speaker, Sheila Walsh, will help us unfold a fresh understanding of what faith is and what it is not. Join us as Sheila guides us through the lessons faith teaches.